Thousands of protesters demanding the resignation of Kyrgyzstan's president over a flawed election rampaged through a southern city on Sunday, burning down a police station and occupying government buildings. The government of the former Soviet republic said it was ready to negotiate, but opposition leader Kurmanbek Bakiyev said talks would only be possible if President Askar Akayev himself is involved. "All other lower level negotiations will be just a waste of time," said Bakiyev, the 55-year-old leader of the opposition People's Movement of Kyrgyzstan. Some analysts have suggested Kyrgyzstan is ripe for an outburst of the mass protests experienced by other post-Soviet countries, such as those that recently brought pro-Western leaders to power in Ukraine and Georgia. The Organization for Security and Cooperation in Europe issued a statement Sunday, urging the government and the opposition to refrain from using force and to begin a dialogue. In Washington, a State Department spokesman, Adam Ereli, said that "U.S. officials have been in contact with both the government and opposition to reinforce this message." As the police station smoldered in Jalal-Abad, 160 miles southwest of the capital, Bishkek, the regional governor said he lacked enough police to restore order. Some injuries were reported, according to government officials in the south and a member of the opposition, but numbers were not available. Protesters occupied seven government buildings across the nation of 5 million people. But the riot Sunday was centered in Jalal-Abad, home to Bakiyev, a former prime minister who lost his bid for parliament last week. A string of nationwide protests were sparked as the opposition accused the government of rigging parliamentary ballots on Feb. 27 and March 13 that gave Akayev an overwhelming majority and seats in the legislature to his daughter, Bermet Akayeva, and son, Aidar. European countries and the United States also said the polls were seriously flawed, a charge denied by the government. The opposition also has charged that Akayev, who is prohibited from seeking another term, planned to manipulate the vote to gain a compliant parliament that would amend the constitution to allow a third term. The 60-year-old leader has denied wanting another term. As protests have grown, the opposition has made three made demands — Akayev's resignation, a new presidential vote and a new parliamentary ballot. Akayev, who has led Kyrgyzstan for 15 years, was long regarded as the most reform-minded leader in ex-Soviet Central Asia and the country won praise for its comparative openness. But the leader in recent years has shown increasing signs of cracking down. In 2002, his reputation was tarnished after police killed six demonstrators who were protesting the arrest of an opposition lawmaker. 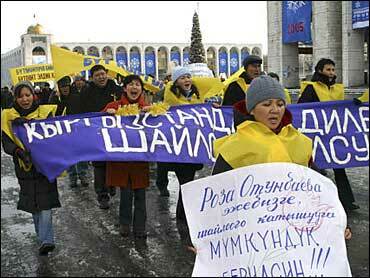 "We hope there will be no further violence," presidential aide Abdil Seghizbayev said. In Jalal-Abad, stone-throwing protesters stormed a police station, causing some officers to take to the roof and fire warning shots in the air, regional government spokesman Orazaly Karasartov said. He said smoke could be seen rising from the police station and that protesters broke windows. Police estimated the number of protesters at 10,000, but local activist Cholpon Ergesheva said 20,000 people participated. She said the protesters ended the attack on the police station after burning down two of its three buildings and forcing all the officers to flee. Ergesheva also said the protesters had occupied the mayor's office in Jalal-Abad, after the soldiers guarding it had voluntarily vacated it. Sunday's riot came a day after police forcibly evicted demonstrators from the governor's office in Jalal-Abad and another government building in the city of Osh. More than a dozen people, including three police officers, were injured and more than 200 demonstrators were arrested, police and civic activists said. Street rallies across the country have also increasingly gained momentum. "The authorities' decision to use force against people won't bring any good. It will only provoke anger," Bakiyev said.